The 57-year-old lady does not like the crown at the site of #10 immediately when it is cemented (Fig.1). 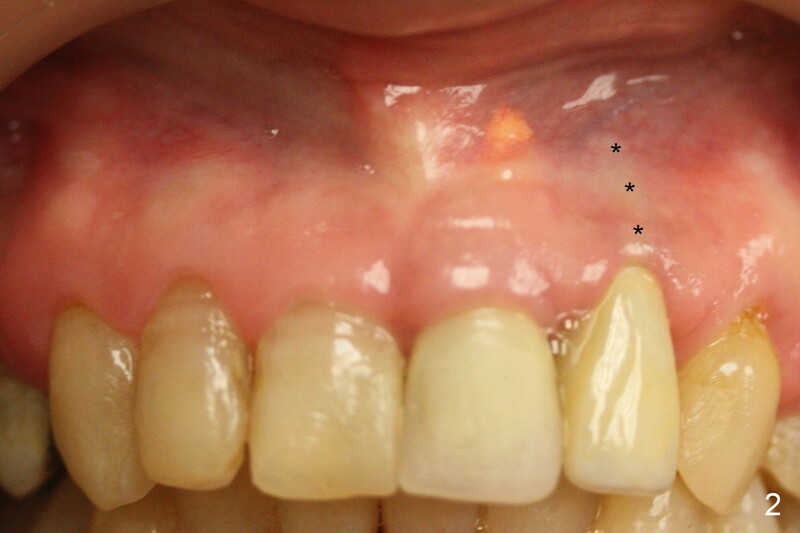 When the upper lip is retracted, it appears that the implant is immediately underneath the gingiva (Fig.2 *). It is slightly tender when palpated. 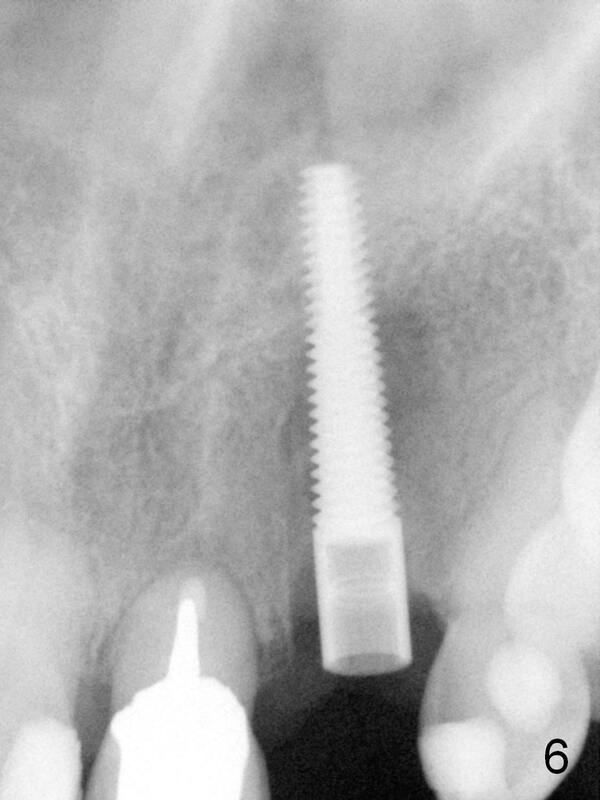 The patient refuses CBCT. 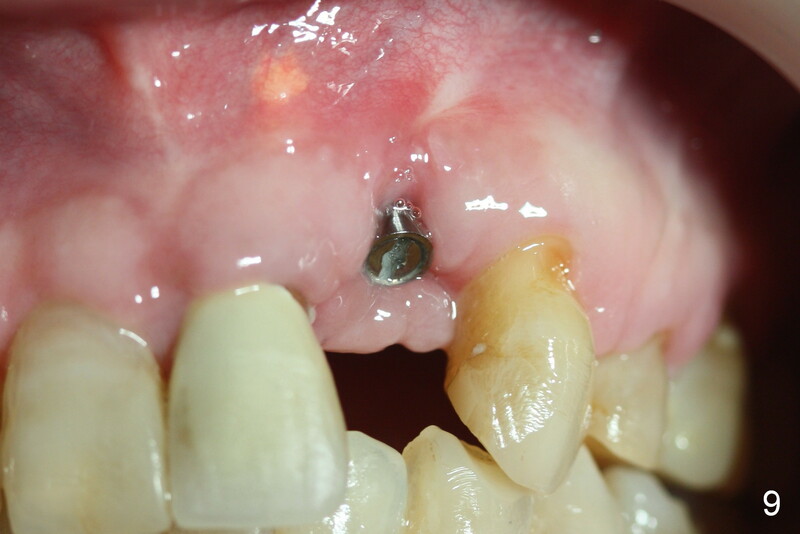 When the buccal flap is raised, the implant is found to be exposed buccally (Fig.3). When it is removed, the coronal portion of the palatal wall is thin (Fig.4). 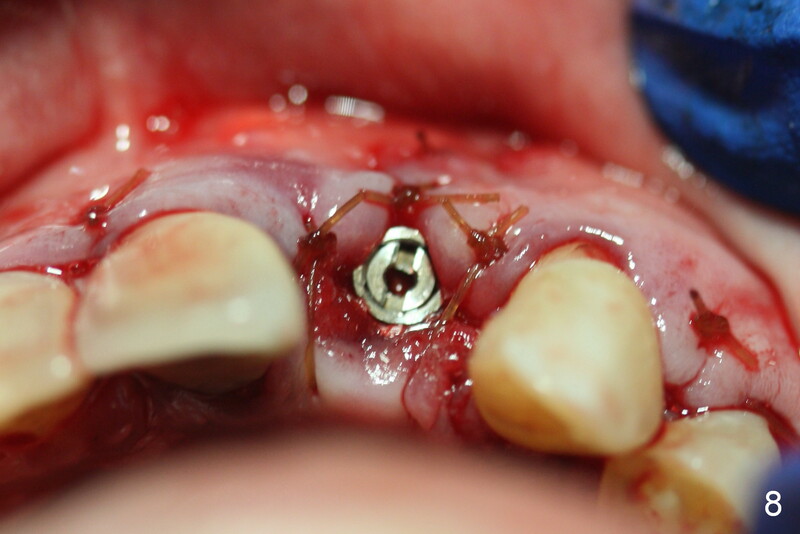 It appears that there is bone in the mid and apical thirds of the palatal wall, where an osteotomy is initiated using a 1.2 mm pilot drill. 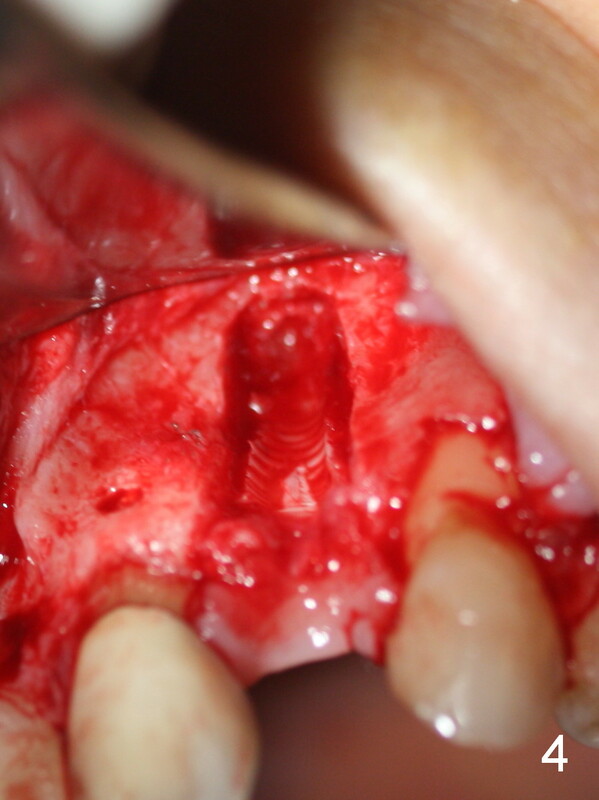 When the latter reaches 18 mm from the crest, the nasal floor appears to be perforated. The latter is confirmed by PA (Fig.5). 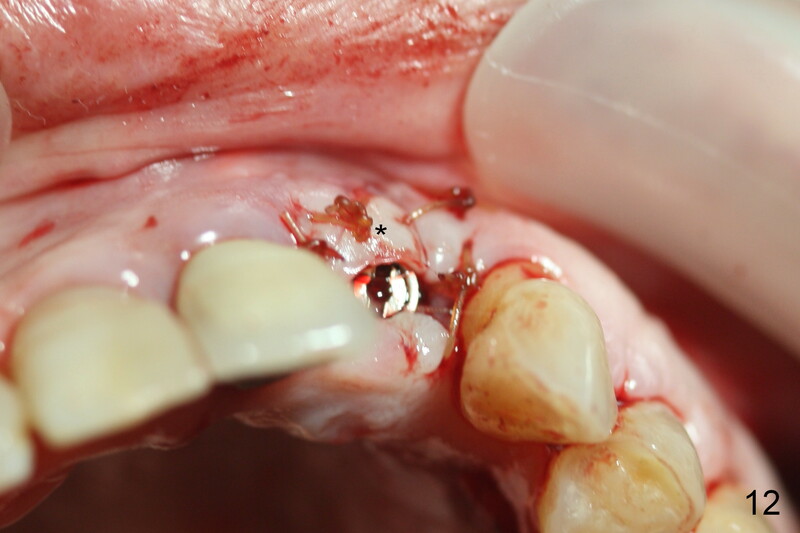 As the osteotomy are increasing in diameter, force is applied as palatally as possible without perforating the palatal wall too much. 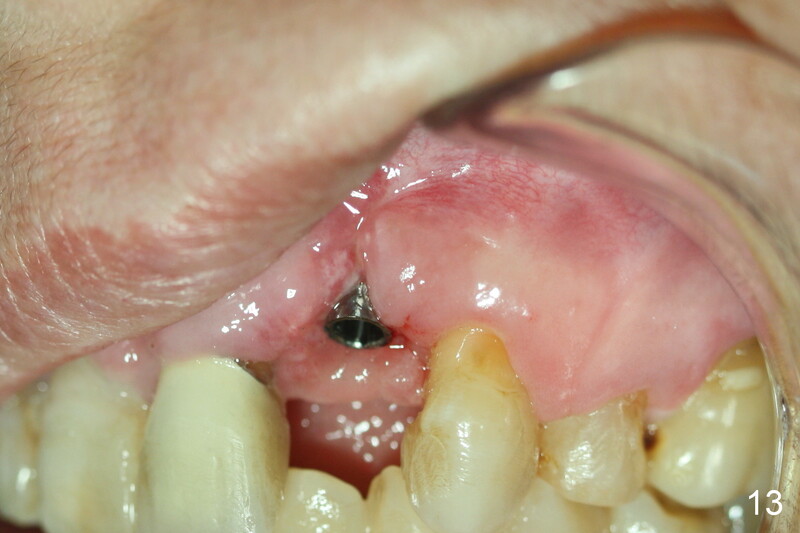 When a 3.5x20 mm implant is placed (30 Ncm), it is palatal to the labial wall. 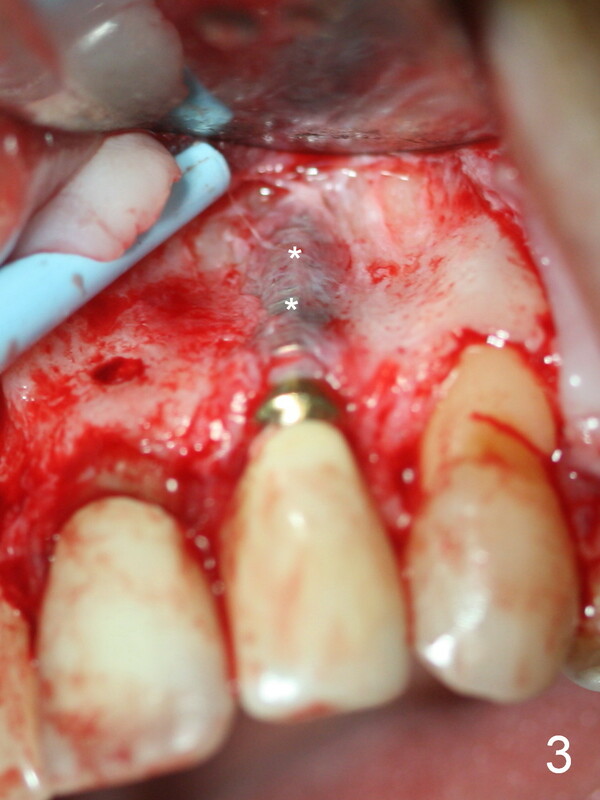 The defect is filled by allograft and Osteogen, covered by long termed resorption membrane. 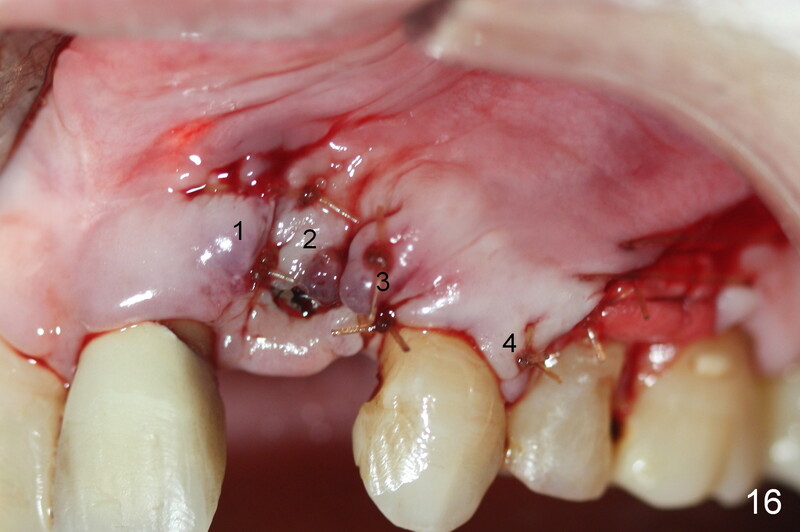 The buccal flap is sutured (Fig.7). 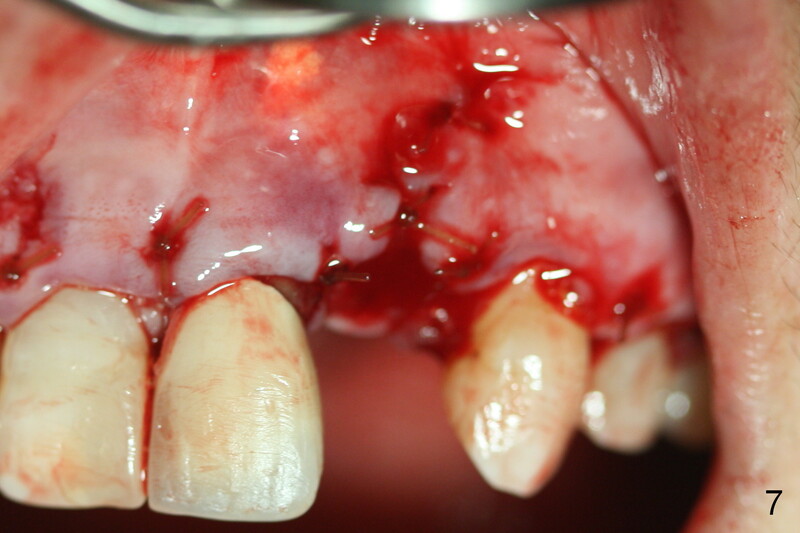 A proposal to place gingival graft is rejected. 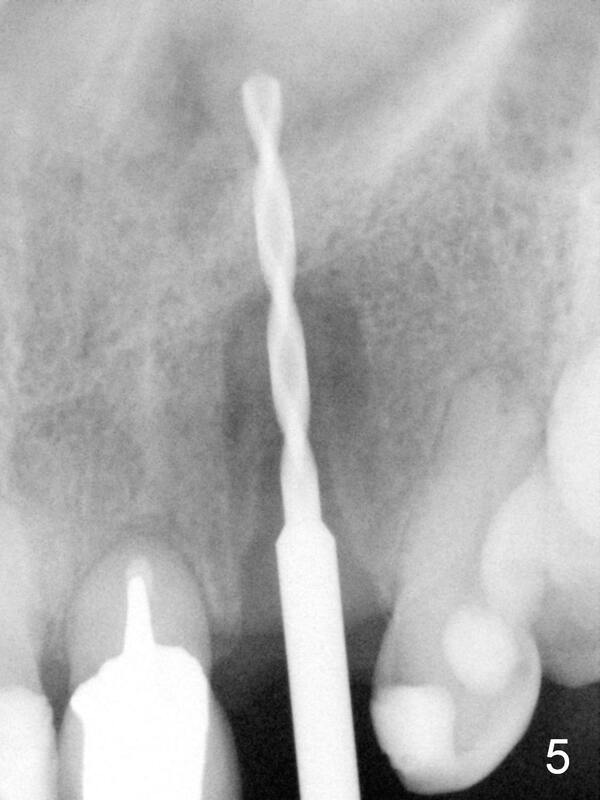 The implant is shown to have been positioned more or less normally (Fig.8). 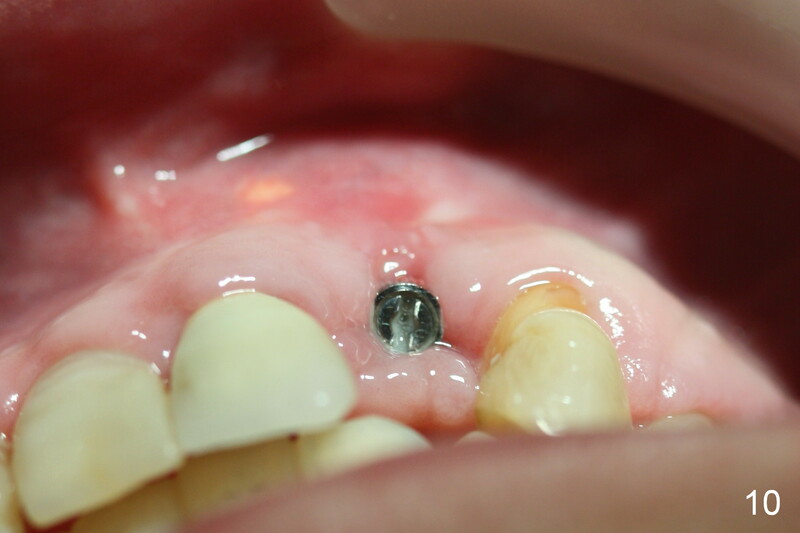 A removable temporary appliance is fabricated. Periodontal dressing is applied. 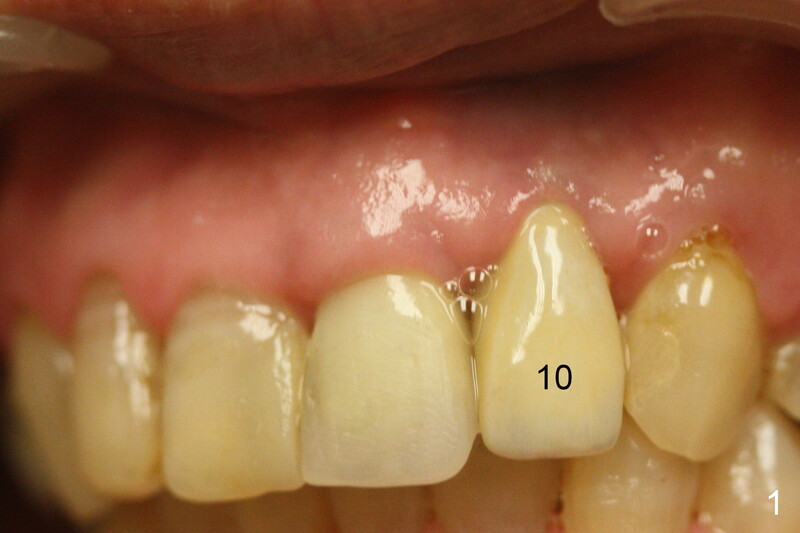 As expected, there is midbuccal tissue deficiency (Fig.9,10: 2 months postop). 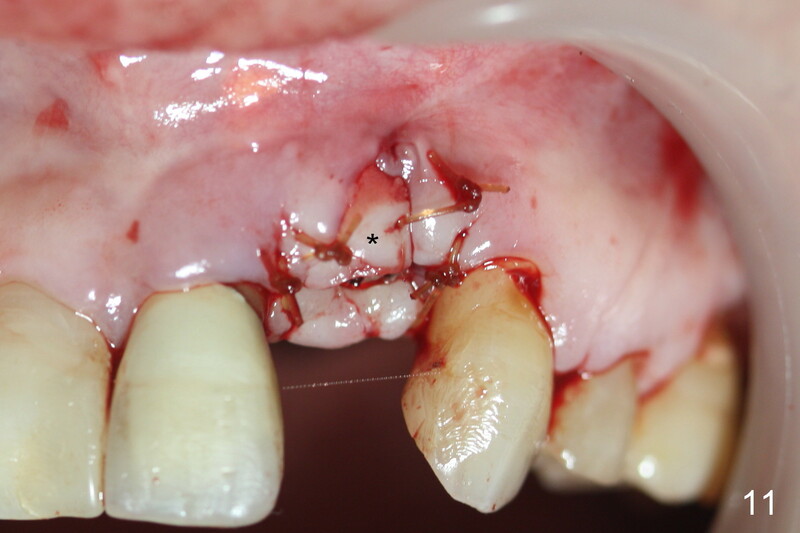 After discussion, a free gingival graft from the palate is placed (Fig.11,12 *). Two weeks later, the graft sloughs (Fig.13). A pedicled flap is designed (Fig.14) and transferred to repair the defect (Fig.15,16).